You wait ages for a clear example of growing Christian hostility to Israel to come along - as evidence of a new anti-Zionism in the churches - and then two arrive together. In my two-part post before Christmas, I used an article in the Catholic weekly, The Tablet, itself inspired by Oxfam’s current campaign focused on Gaza, as the starting-point for my analysis of the reasons behind the increase in anti-Israel sentiment among Christians. 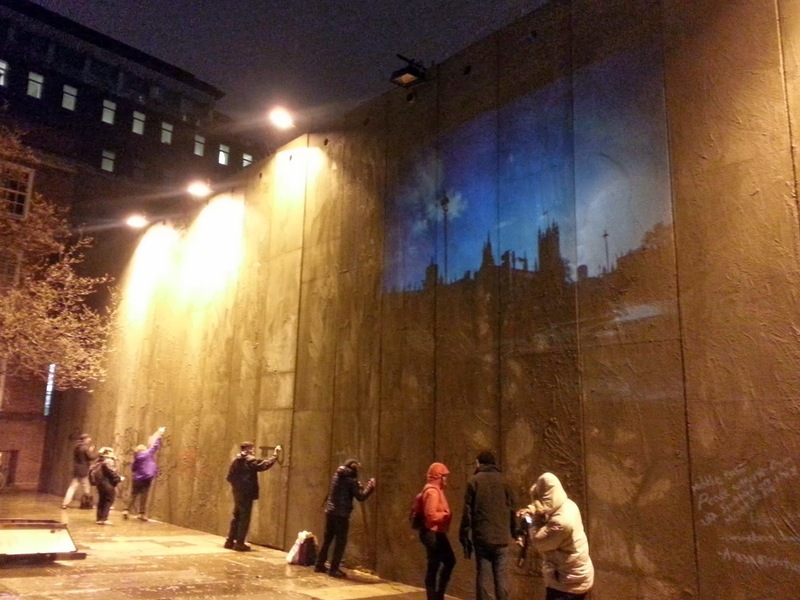 But barely a week had passed before news emerged about an even more egregious instance of partisan ecclesiastical posturing on the Middle East: Bethlehem Unwrapped, a Christmas ‘festival’ at St James’ church in Piccadilly, which had as its centrepiece what purported to be a lifesize replica of the ‘separation wall’ surrounding the ancient city. I don’t propose to offer my own critique of this controversial campaign here, except to say that it seems to me to be guilty of precisely the same sins of which I accused Elena Curti’s Tablet article, the Oxfam Gaza campaign, and (some time ago) the ‘If Greenbelt was Gaza’ event. That’s to say, the festival at St James’ manifests the same obsessive focus on the supposed sins of the Jewish state to the exclusion of all other contemporary issues; its treatment of the issue is appallingly one-sided, dishonest and misleading; and it completely obscures, and indeed shows no interest in the voices and perspectives of Israelis, and in particular of the Jewish victims of Palestinian terrorism. There’s no need for me to say any more, since others have already responded with far greater eloquence than I’m capable of. Douglas Murray bemoans the ‘absolute moral squalor’ represented by the installation at St James’, reminding us that the church has form on this issue, having previously hosted an event where participants sang ‘versions of carols which decry the Jewish state’. (‘Once in royal David’s city / Stood a big apartheid wall’ ran one particularly execrable parody.) Murray condemns the obvious one-sidedness of the current campaign, in which ‘the visitor is invited to believe that all the problems of Bethlehem’s Christians today stem from Israel’s security fence’, while no reference is made to the fact that ‘Christians are being gradually cleansed from their historic homeland by Muslim Palestinians,’ or to the wave of persecution of Christians in every other country in the region except Israel. How sad it is that this church, the British Methodist Church, and many other Christian leaders are blindsided in their pursuit of a perceived Jewish enemy that they fail to come to the rescue, or campaign for, their co-religionists, persecuted by those who they actively and expensively support. Melanie Phillips has written an open letter to the Archbishop of Canterbury, wondering how he can reconcile the message of love in his Christmas Day sermon ‘with the fact that one of your churches, St James’s Piccadilly, chose Christmas to turn itself into a church of hate?’ Listing the lies about the security ‘wall’ embodied in the church’s campaign, Philips describes the ‘stunt’ at St James’ as part of a ‘wider anti-Israel bigotry in your church’, going far beyond this particular campaign. Nevertheless, like all walls, it serves as a facade and a barrier. If your wall was scrutinised, one would see that underneath the whitewashed surface that concerns itself with Israeli policies, there are blocks of anti-Semitism. It is mendacious because it carries no message to explain why it is there, when it is explicitly there to deter violent attacks from the West Bank into Israel. It is mendacious because it carries no statement alerting onlookers to the fact that the barrier has already saved thousands of lives. Or does saving lives really not matter to Christians? Or are Jewish lives not as important as the lives of suicide bombers and other terrorists? If you seek fairness ­and I suspect you do in a muddled way ­why did you not contact the Israeli embassy, who could have loaned you something apposite: a bus, on board which passengers died when a suicide bomber detonated himself? Finally, Alan Johnson of BICOM took part in a debate at the climax of the Bethlehem Unwrapped festival last Saturday (transcript not yet available, as far as I know), and also debated Rev Lucy Winkett, rector of St James on BBC Radio 4's Sunday programme - the segment starts about 37 minutes into the programme. An update on the update (8th January): You can read an abbreviated version of Alan Johnson's powerful contribution to the end-of-festival debate here.